Do you have so many shoes that you keep running out of places to store them? Yeah me too! If you have extra hanging space you can make use of it with this Innovative DIY Shoe Storage idea. This is a very quick DIY project that is easy to complete. All you need is some wire hangers and a pair of pliers. If you want to decorate your shoe hangers you can use some fabric as shown. If you are a little short of hanging space in your closet you could consider adding a second rod for your shoes lower down in the closet. Here are some handy and inexpensive shoe storage ideas that you can buy online. ^ Over the Door Shoe Rack a great space save and simple to install. 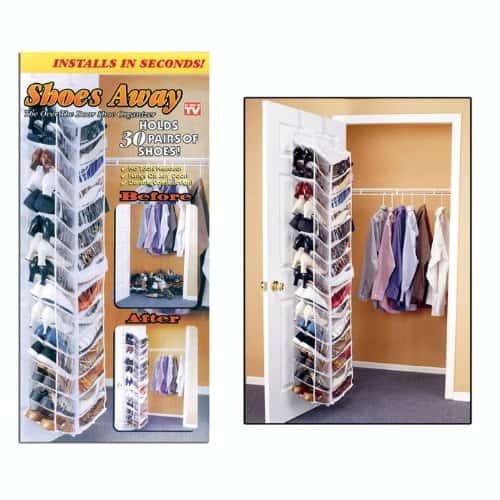 ^ Hanging Closet Door Shoe Hanger stores up to 30 pairs of shoes.